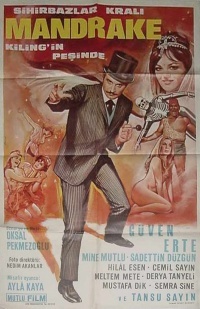 In 1967 there was made a 56 minutes movie in black and white by Mutlu Film. "Sihirbazlar Krali Mandrake Kiling'in Pesinde" is also known as "Mandrake Killing'e karsi" and "Killing vs. Mandrake". Long thought to be a lost movie, but has recently reappeared. This page was last edited on 27 October 2018, at 15:18.